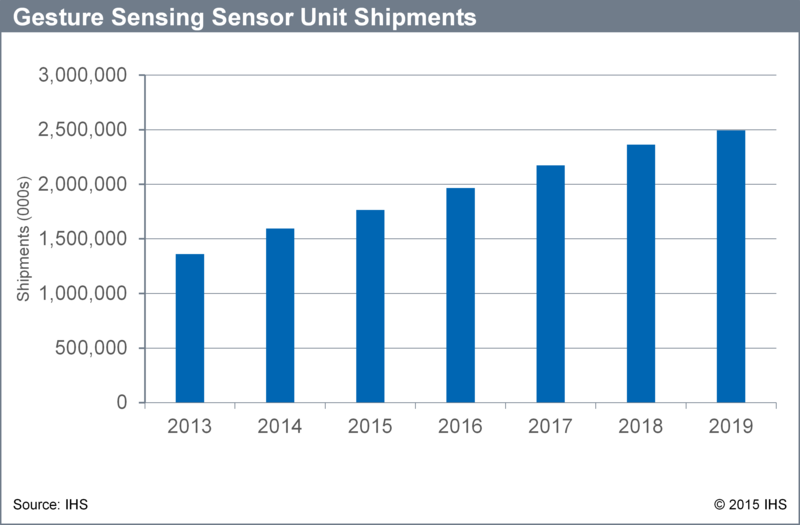 With emerging virtual reality games, smartwatches, smart TVs and other consumer electronics and information technology (IT) applications entering the market, shipments of gesture sensing control user interfaces are poised to grow 10 percent year over year, to reach 1.8 billion units in 2015. While touch-screen technology works well in smartphones, tablets and other mobile devices with flat panel displays, it is less suitable for use in some new and emerging applications; therefore, gesture sensing control will fill an industry need gap, according to IHS Inc. , the leading global source of critical information and insight. Optical-based three-dimensional (3D) depth sensing technologies — such as time of flight (ToF), stereo vision and structured light for freehand gesture sensing control — will account for two thirds (66 percent) of sensor unit shipments for game console applications in 2015; as the use of controller-based sensors becomes more common. Due to Intel’s promoting RealSense, gesture-sensing control with 3D depth-sensing ability is expected to grow 43 percent in 2015, year over year, overtaking two-dimensional (2D) webcam technology, in notebook PC applications in 2015. Apple TV will also likely adopt the structured light technology Apple acquired from PrimeSense, which would lead to 35 percent year-over-year growth in gesture sensing control for smart TV applications.